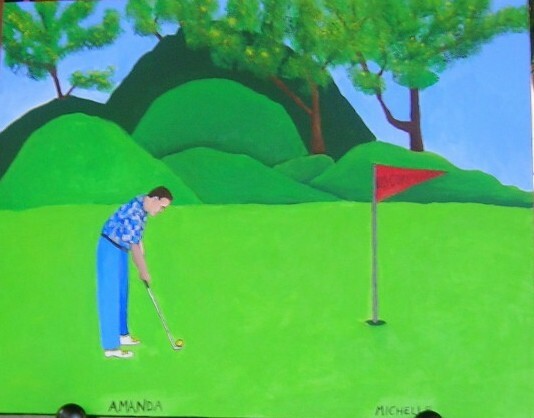 Amanda Mickowski and Michelle Nguyen, two young patients at M D Anderson Pediatric Cancer Center in Houston, painted the “Los Compadres Golfers”, to be auctioned at the Los Compadres Golf Tournament in 2004. Sadly, Michelle passed away shortly after the painting was completed. Bill and Christina Rathbun purchased the painting that year. The Rathbun’s donated the painting back to the auction in 2005 and a new Rotary Club of Lake Conroe tradition was born. The painting returned to the Los Compadres Auction each year for 10 years. The painting is now being donated to The Pediatric Wing at M D Anderson, to hang proudly in honor of Amanda and Michelle and the many brave children who have passed through the doors of the hospital. Each year, the buyer of the Amanda-Michelle Painting received one of ten identical necklaces hand made by noted jeweler Meredith Knox, who designs all of the jewelry for The M D Anderson Children’s Art Project. The necklace includes the Ruffled Heart Charm from the Art Project Collection, created by another MDA Special Child.